Ruth Baillie is a fellow bird lover and artist over at Birdland Creations, who conceived the idea of a "Bird a Week" challenge. Bird fanatic that I am, how could I resist? For my first entry, I finished another page in my Bird Journal. This one is titled Branch. I constructed the small 6"x6" journal from blank watercolor paper. Color was randomly applied to every page, using washes of acrylic paint. Using white ink or paint, I swirled in the scrollwork in the background. I printed out photos of various species of birds from a Google image search, which were then trimmed and pasted in. 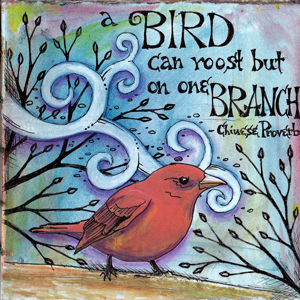 From my collection of bird themed quotes, I chose one to fit the page, then penned it in by hand in my own original font. Details were added: crosshatching, floating ovals, shading and extra color with watercolor pencils, alterations to the birds, etc. Your journal pages are just so beautiful Vickie. I love them. Good to read the process too. Very nice journal. Love the birds.